Getting reacquainted with a Sedgwick machine for the first time in ages brings fond recall of its two-tone blue livery and its square and very solid build, so nothing has changed there then. Sedgwick gear is very firmly rooted in the good old British past where simple well-built machinery was prevalent, but does it meet 21st-century expectations? 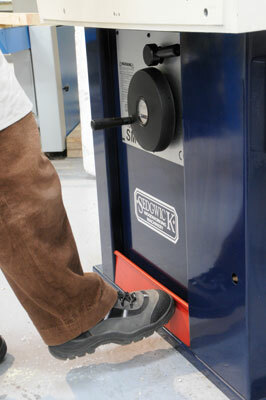 The pressed-steel casing is very rigid with four extended bolt-down foot positions. The cast-steel top is large and accurately ground flat, so no surprises so far. The cutterblock housing is a big heavy casting onto which all the other bits and pieces are bolted. There are alternative bolt holes for fixing it down and likewise the fence facings can be fitted in two different positions although only one of them makes sense on this machine. All in all, then, it is well laid out and the build quality inspires confidence. 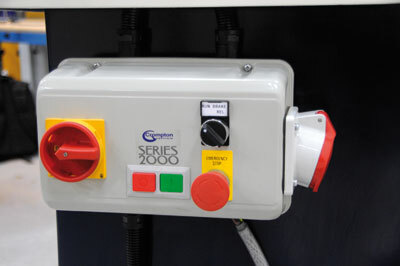 The switchgear is substantial and comprehensive, and is mounted on the side of the casing. 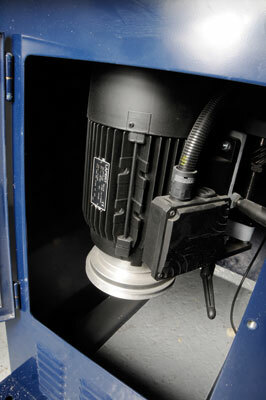 It incorporates an isolator, on and off buttons, emergency stop button, electric brake release for adjusting the cutterblock while automatically isolating the machine and, lastly, a covered socket to take a powerfeed for which, incidentally, the cast-iron top is not drilled as standard. Added to this switch spec is a flat red paddle switch at the bottom front of the casing which triggers the DC braking when tapped with a foot; not quite as satisfying as the cast-iron drum brake on an old Wilson FV with the pungent smell of hot brake material when depressed, but probably more effective. The fences are dead flat to each other with a heavy lump of metal behind each and both adjustable with micrometer twist knobs for exact setting. Bristol levers are, however, my perennial gripe and the Sedgewick isn't immune to clashing levers when setting everything up; they work but can be a nuisance. However, a minor but significant feature is that if a lever is pulled out, a T-bar Allen key can be used to spin the threaded bolt in or out to avoid real clashes when adjusting them. The insert rings were glued together with oil but once removed they popped in and out more easily; however, the first time required a big spanner and some rag to avoid denting the edges of the rings. By comparison the spacers on the spindle shaft slid on and off more easily than any I have tried although there was no hint of play. 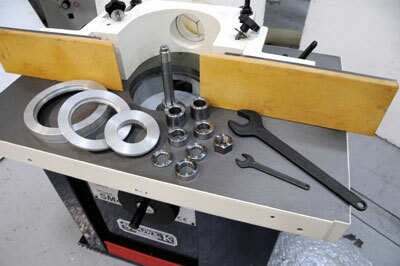 Incidentally the shaft can be exchanged between standard sizes or for a router collet type. 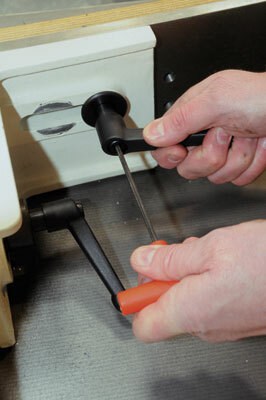 There is an optional sliding table for cutting tenons which we weren't able to test, but I think that if you are serious about scribing cuts and tenons this would be a very worthwhile addition. The motor and bearing were well balanced and ran smoothly, the pulley belt is reasonably accessible for speed changing although mid speed at just over 6,000rpm is usual for most purposes. The Shaw guard setup was rigid and worked well once adjusted, and the fences also did their job. 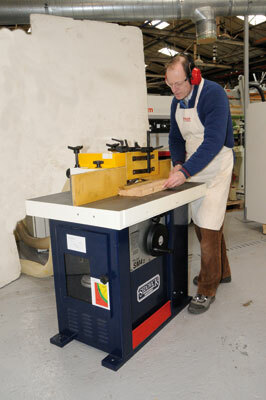 This is a solid machine with good safety features, capable of both cabinet work and joinery. 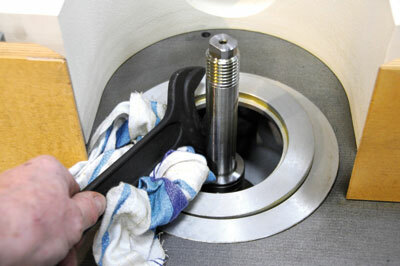 A power feed would also be a sensible addition for many tasks. "The cast-steel top is large and accurately ground flat"